Being a stay-at-home mom is a wonderful journey that should be enjoyable. When I first quit my job to stay at home, I thought that I would need to have a strict stay-at-home mom schedule for myself and my kids, in order to make it work. I read about suggested schedules and all of the happenings that should be taken care of throughout the day. Eat, sleep, indoor play, outdoor play, learning time, circle time, tummy time, nap time, screen time, and the list went on and on. When I tried to implement all of these things into our day, I noticed two things: I was stressed out and my kids didn’t get to do what they loved the most (or finish what they had started working on). I quickly realized that in order to have a stay-at-home mom schedule that works, I would need to loosen up a little (read: a lot) and let my kids lead the way. Of course, I am in charge of eating time and bed time, otherwise those things would NEVER happen. But for the most part, we follow a rhythmic schedule that is dependent on how we feel that day. The things that I base our “schedule” on may seem simple and obvious, but I feel that they are overlooked when moms are trying to figure out how to spend their days as a stay-at-home mom. To me, this is the most important thing to consider when coming up with your stay-at-home mom schedule. 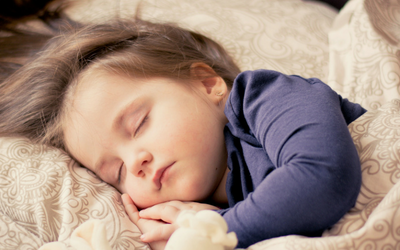 For kids, sleep is the cornerstone of their development, and should be treated as such. That is why I don’t follow schedule, as much as I follow a rhythm. Our day begins and ends with sleep, therefore the rest of our day revolves around it. I know that if I make an early appointment, or commit to an early play date, my kids will probably have to be woken up. And when that happens, it pretty much ruins the rest of our day because the kids are exhausted. Think about your kids’ sleep schedule. What rhythm can you create in your day that includes plenty of sleep for your kids? If your kids need a nap during the day, plan your day around it. Not only does it make for a happier child, but brain development and physical development hinge on the amount of sleep your child gets. Eating is another biological factor, like sleep, that can make or break your day. You would think that it is common sense to keep your kids full, but they are literally hungry all.the.time. That’s normal and sometimes hard for us adults to understand. I once read somewhere that kids need to eat every two hours! Create your daily schedule around that idea! Your kids will be happier and your day will run much more smoothly on full tummies! The age of your kids is going to be a huge determining factor in how your days play out as a stay-at-home mom. As moms, it’s easy to get ahead of ourselves and think that we need to be doing all.the.things. when it comes to our kids and activities. However, this couldn’t be further from the truth. When you look at how you will spend your days, make sure that it is developmentally appropriate for your kids’ ages. Toddler and babies should not have their days jam-packed with exhausting activities. This can lead to more temper tantrums and an over tired kid. I’m not saying zero activities, I’m just saying to choose wisely when you are planning out your days. My kids are happiest when I leave them to their own imaginations. They will play and create for hours when they are self-led. Of course, I make the occasional suggestion and show them how they can branch off of their ideas, but for the most part, our days consist of their ideas. When I was first a stay-at-home mom, I thought that I would plan all sorts of activities for my kids and they would love every.single.one. As my kids got older, I realized that they have the most fun and are the most creative when I don’t try to interject all of my ideas. Your kids will dive into their interests and passions, if you let them. You don’t have to fill every single day with a ton of activities just to stay busy. Make sure that the things you’re planning are meaningful and always take your kids’ interests into consideration. Activities you and your kids want to take part in. When my daughter was a baby, I took her to a “Mommy and Me” dance class. It was fun to spend the time together and bond, while getting out of the house. It certainly wasn’t necessary, but it did break up the monotony of being at home all the time. We took part in several years of “Mommy and Me” dance and gymnastics classes. She tried to fly solo at three years old and it just didn’t work for her. She was too scared to be away from me. I didn’t push it. We quit. It wasn’t until she was 5 1/2 years old that she was finally able to be in a gymnastics class that she loves and wants to go to on her own. I know that there are some parents who have their toddlers in every activity under the sun. Then there are parents of teenagers who don’t have their kids in any activities at all. It totally depends on what is best for your family. Don’t compare yourself to your neighbor who drives her kids to activities every day of the week. When you think about your stay-at-home mom schedule, think about what activities your child would enjoy. Try them out. But, if it doesn’t work, don’t stress and don’t push your kid to do something that they hate. One structured activity a week is PLENTY for a toddler. Zero structured activities is good too! As your child gets older, their interests will develop and they will figure out their passions. Let them lead you to what activities they want to participate in. Something that I’ve realized about myself as a stay-at-home mom, is that I do not love being “on the go”. In fact, I prefer a much slower lifestyle where I can actually enjoy my kids. I don’t want to look back in five years and see a blur of activities that I can’t even remember. I am also terrible about eating a healthy diet when I am at home. Usually I’m cooking for my kids and completely neglecting the fact that I need to eat also! This is part of my own self-care. I know that if we are constantly busy, or if I am not eat properly, then I will be irritable and exhausted. You MUST take your own self-care into consideration as you plan your stay-at-home mom days. This means, that you have to actually take care of YOU while you’re taking care of your kids. As moms, it’s natural to sacrifice and do everything for our kids, while completely forgetting about ourselves. To a point, that’s fine. But, eventually you will crash and burn. Trust me, I know. Self-care can be something simple, such as eating a balanced diet, but it also means that you treat yourself occasionally. If at all possible, have someone watch your kids while you take time for yourself. This is a great way to rejuvenate and refill your own soul, so make sure you plan for it in your stay-at-home mom schedule! Necessities that have to be taken care of. Another thing to think about for your stay-at-home mom schedule, is how you will fit in your necessities. When will you grocery shopping and run other errands that are on your to-do list? I prefer to spread most of my errands out over a couple of days during the week. That way, I am not loading and unloading kids several times in a day, AND it breaks up our days a little bit. 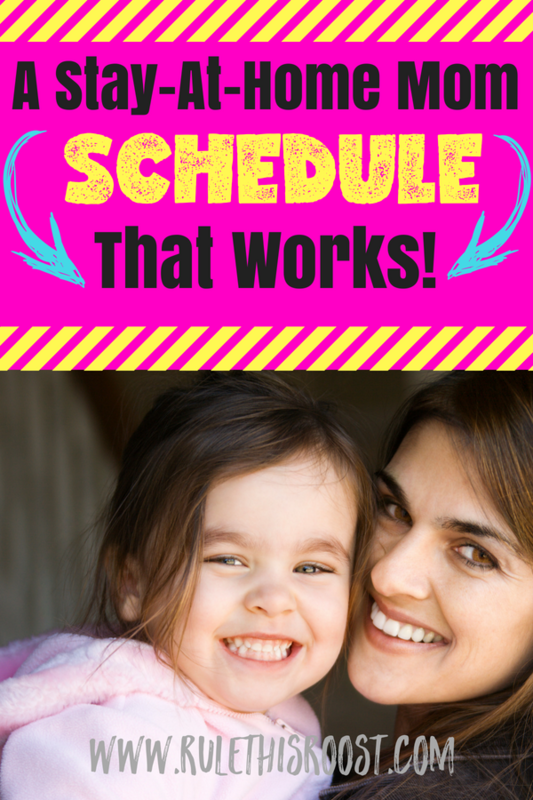 Having a stay-at-home mom schedule doesn’t mean you have to have a strict, minute-by minute, or even hour-by-hour plan. The best days are the days when you can slow down and enjoy watching your kids play. Don’t let the stress of a schedule take over your days of being a mom. It is more important for your kids to get to be kids, than for them to be on a schedule that doesn’t jive with your lifestyle. Do you follow a strict, or relaxed stay-at-home mom schedule? Comment below!